At their home, Dream Castle, the ponies are cantering through flowery meadows and grassy green fields with their animal friends. Elsewhere, Baby Lickety-Split is practicing a new dance step, as Spike accompanies her rehearsal on the piano. Meanwhile, at the Volcano of Gloom, a wicked witch named Hydia and her two daughters, Reeka and Draggle, want to spoil the ponies’ fun. 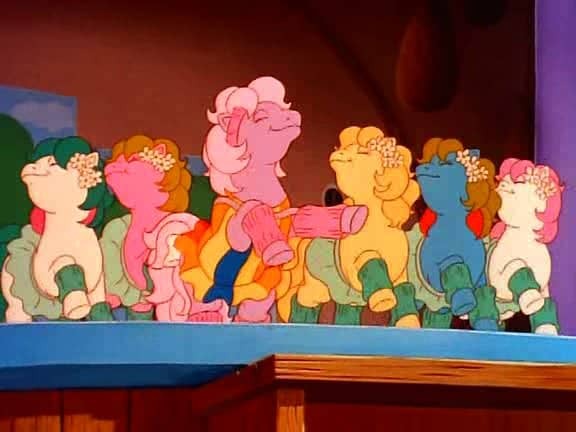 During the baby ponies’ dance performance, Lickety-Split attempts to add her own dance and ruins the whole performance. She is told off by everyone and runs away, followed by Spike, only to end up falling down a waterfall and trapped in a valley. The two witch sisters try to ruin the ponies’ festival, but thanks to the Sea Ponies, end up getting washed away in an overflowing waterfall.